Alana Olivers is a very inspirering woman who I’m following on Instagram & Youtube. We have very similar interests, within health, skin, and the whole mind body connection. Alana works as a skin coach and is just such a positive person, and I am so happy to have created such a beautiful ‘online friendship’ with her, without even having met her in real life. I find Alana very inspirering, and she has so much knowledge within the field of skin & health, which she is going to share much more of in this interview. Dear Alana, will you tell us a little bit about yourself? Who you are and what you do? I was born and grew up in Switzerland but I now live all over the world. I am a skin coach (I help others to make their skin look and feel its best) and I run my own company in Switzerland where we produce 100% natural, personalized, cruelty free, vegan skin care. My passion is to empower and help others see how amazing their bodies’ healing abilities are and to show them how much modern medicine underestimates what the body and skin can do all by itself, without any pills, just by giving it the right ‘fuel’ and treating it as a whole. I am an introvert who loves to read books about health, the skin, the brain, genetics, epigenetics, psychology and the mind, who didn’t have a social media account until 24 years old and now tries to figure out how it works while still feeling weird in front of a camera every time 🙂 . I believe that our health is the biggest wealth we have in life and that we should appreciate and respect our body and trust in its abilities and I hope to inspire others to see that the same way. You share lots of skincare tips on your Youtube and Instagram, what made you become interested in skin? And, how did you gain the knowledge that you’ve learned? A couple of years ago I was diagnosed with something which made me spend a lot of time in the hospital getting treatments and surgery which ended up weakening my immune system massively. Apart from my completely weakened body, I started to get skin rashes and acne, my body overreacted to literally everything and no skin care helped. I tried everything from affordable to extremely expensive skin care, but somehow it just made things worse. I started to look into the ingredient lists and I was shocked to find out how many chemicals were in there. I knew that there had to be a better way. I started to read all the books I could get my hands on about healing the skin and the body. I cleaned up my diet and my lifestyle as well as making my skin care myself to make sure I can control all the ingredients. What are your 5 best skincare tips? The foods you consume far outweigh the skin care you are applying topically, so make sure to heal your skin from within before spending money on something which can only (in the best case) help with the symptoms of your problem. Never forget that your skin is just part of a whole organism, your body. You can never heal the skin without healing the body, and as soon as you heal your body, your skin will be healthy as well. 80% of what you apply to your skin will be absorbed directly into your bloodstream. So make sure that the skincare you apply only contains ingredients which you would also feel comfortable with if you would have to eat it. What is 1 thing you have experienced that most people do not think about when they want to improve their skin, which actually has a huge impact on how your skin looks? Definitely the gut health. The health of our digestive tract influences the health of our skin directly. Many of my clients are a little surprised to say the least when I ask them about their bowel movements since they booked a consultation which should cover their skin problems. But your gut is an organ which is responsible to eliminate (literally:P) everything your body doesn’t need and the digestive tract also has the vital job when it comes to absorb nutrients and vitamins. If your gut is overwhelmed or constipated it can happen that part of your already digested food gets reabsorbed into your bloodstream which leads to inflammation which in turn can lead to acne and/or rashes and eczema. It is so important to take care of your gut health, to me it is the seat of our health, really. If your gut isn’t healthy your whole body (including your skin) is out of balance. So, make sure to eat enough pre- and probiotic foods, avoid processed foods and junk foods and lower your sugar intake. After taking antibiotics make sure to use probiotics to bring the “good bacteria” back into your digestive tract. Do you have some daily rituals that you do every single day? I always start my day with a 10-20 minutes Meditation and I usually also finish my day like this (it is one of the best rituals I have every implemented into my daily life). 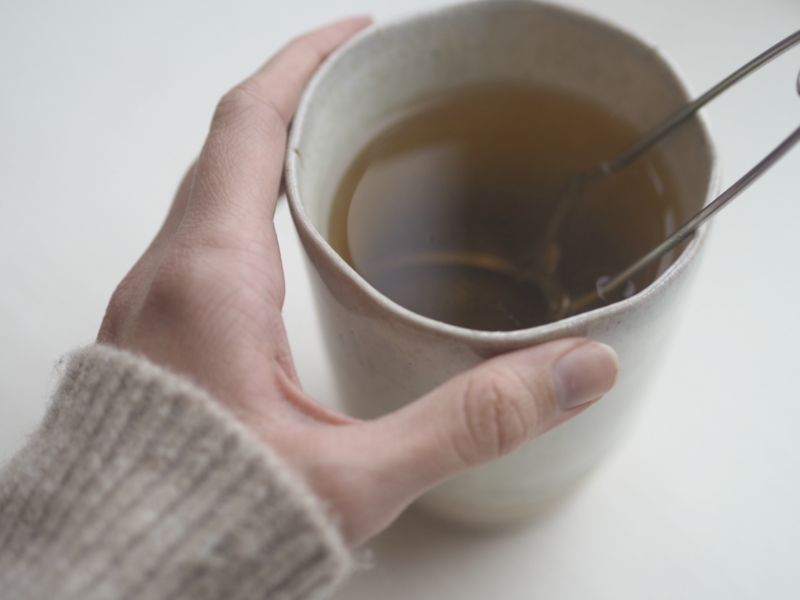 The second thing I do is that I start every single day with lots of warm water (I either add lemon, ginger, turmeric, apple cider vinegar or some sort of tea to it, whatever I have on hand that day). I also work out every single day since I believe that an active lifestyle is so important for a healthy body (and beautiful skinJ), I either run, go on a bicycle, go for a hike or do yoga. Another ritual I have is that I read or listen to an audio book every day (usually before bedtime, and always when I commute) for at least 30min – 1 hour. My skin care routine is extremely simple. I use the oil cleansing method to cleanse my face in the evening. After that I always have a look at my skin and decide what it needs that day. That might just be some fresh Aloe Vera or a serum, or a mask, Vitamin C, or a product/DIY which contains AHA or BHA to exfoliate my skin (I only exfoliate my skin 1x a week). After that I just apply my 100% natural night cream and go to bed. You have also created your own skincare line. Can you tell us about the products you have created? My Skin Care Company is based in Switzerland and is called “Natural Choices”. And this is exactly what the products are all about. They are 100% natural, cruelty free and vegan, they are free from chemicals and preservatives as well as silicones and parabens. I think our skin is so different from everybody else’s. That’s why all the products are personalized (that means a person comes for a skin analysis or has a skin coaching session with me and after that we choose each ingredient for each product specifically for that person and then creates a unique product). The benefit of that is first of all that we can address the specific skin problems with ingredients which matches the specific needs of our client, and also that we can change the formulation once the skin starts to get better (as well as making adjustments for Winter/Summer time). Which books have changed your life? What is your best advice for people who are dealing with skin issues and are feeling insecure because of their skin? For sure it is always hard to deal with skin problems just because it is usually not something you can easily cover up and everyone sees it so you feel exposed and judged, at least that is how I felt. The most important advice I can give is to try to shift your perspective about it. It is not an easy thing to do, but it is truly life changing. Don’t see the rashes or pimples or dry flakes as something your body does against you but as something it does FOR you. Try to see it as the language your body communicates with you. It tries to tell you that something is wrong, that for example your digestive tract or your liver is overwhelmed (breakouts, dull skin f.e. ), or you don’t get enough sleep (dull skin, dark circles), or that your body is chronically inflamed (rashes, eczema, acne). If you look at your skin problems from that perspective, then first of all you can figure out the cause for it and solve your problem at its root instead of just treating the symptoms, plus you enter into a much deeper relationship with your own body and will soon learn to read every sign it gives you and act accordingly. Once you have been able to heal your skin you’ll be so much stronger and grateful for the process you had to go through because other people will never get the chance to learn this. Which 3 people have inspired you most in your life? He is one of the leading figures when it comes to the body mind connection. His books introduced me to Ayurveda, to mediation and taught me how important our mindset is for the healing process of our body. My Brother and me went through a lot together and have an extremely strong relationship. He unknowingly teaches me new lessons every single day but the most important thing he taught me is probably that being yourself and to stand up for who you are is certainly not always the easiest way but that it is always worth it, and in the end the most rewarding. If people want to learn more about you, or support you in any kind of way, where can they do this? Thank you so much dear for answering my questions, and for being such a ray of sunlight that you are and for sharing your knowledge with such an enthusiasm and passion! Thank you so much, I feel extremely honored 🙂 You are such a beautiful person! If you have been following along in here, you might know that my predominant dosha according to Ayurveda is ‘vata’. I have written a longer blogpost before about what ayurveda and doshas are, and what the characteristics are for each dosha. But, today, I want to share some vata skincare tips with you. You are most likely thin and have a delicate body type. You are prone to dryness, flakiness, dark sports, and premature fine lines and wrinkles (Hello me! Whenever it gets just a bit colder in, my skin are very prone to become dry). Your skin type is normal to dry. There are plenty of things you can do to ‘balance’ an imbalance. Here are some tips I’ve found, which can help your skin if you are predominantly vata. Try to create some routines and stick to them. Vatas are known for their creativity and tons of ideas, but they have a hard time sticking to things, even though they would benefit highly from this. Try to create some routines for yourself to get more grounded. In connection with routines, getting a regular sleep is also so important. Try to go to bed at the same time each night, and you can also try to create a before-bed-time routine, something that relaxes you, calms you down and prepares you for sleep. That could be making a little evening skincare routine, with candles, slow music, followed by reading a book in bed with low lights. 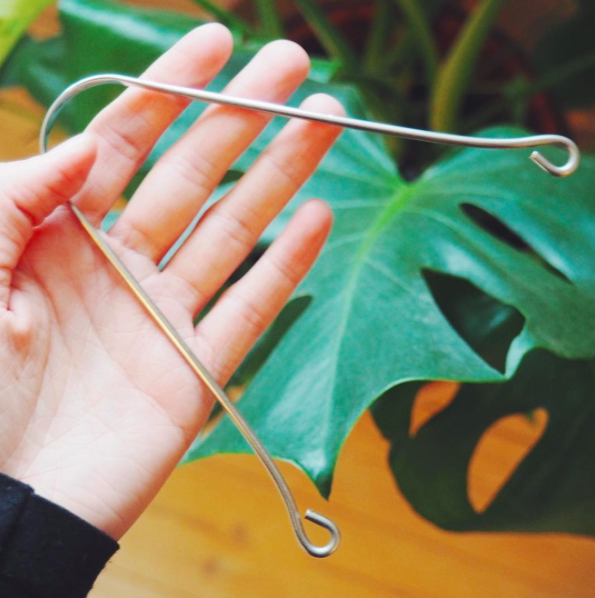 Vatas freeze very easily (my boyfriend can vouch for this, I almost always have cold hands or feet). To balance vata it is therefore very important to keep your body warm. Wear warm clothes, gloves, scarfs. Eat warm food (soups, sautéed veggies). Drink herbal teas. Don’t over-exercise, but strive for more grounding activities. This could be yoga, walking, pilates, swimming, dancing, or shorter hikes. Healthy fats are so good for you and your skin, since these really moisturise your skin from the inside and out, and really keeps the skin hydrated. 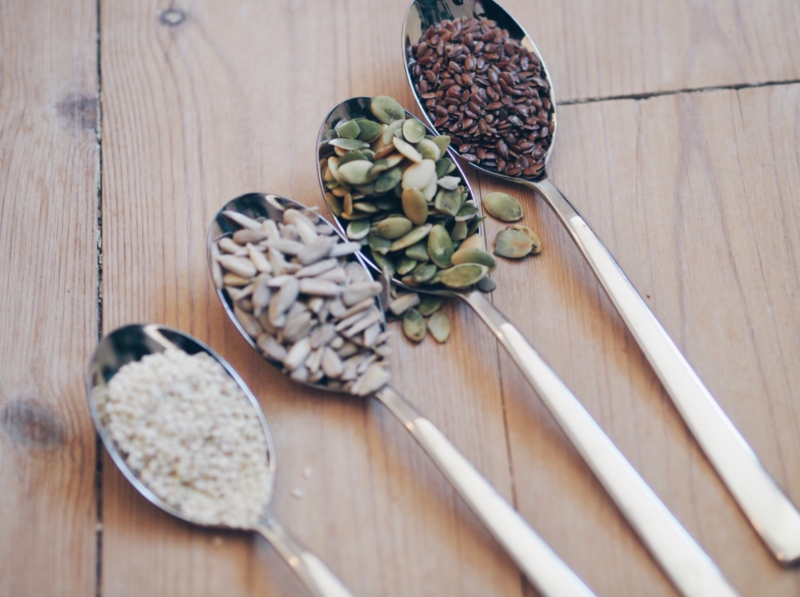 Healthy fats includes nuts, seeds and avocados. Use very gentle cleansers, so you don’t over-dry your skin. 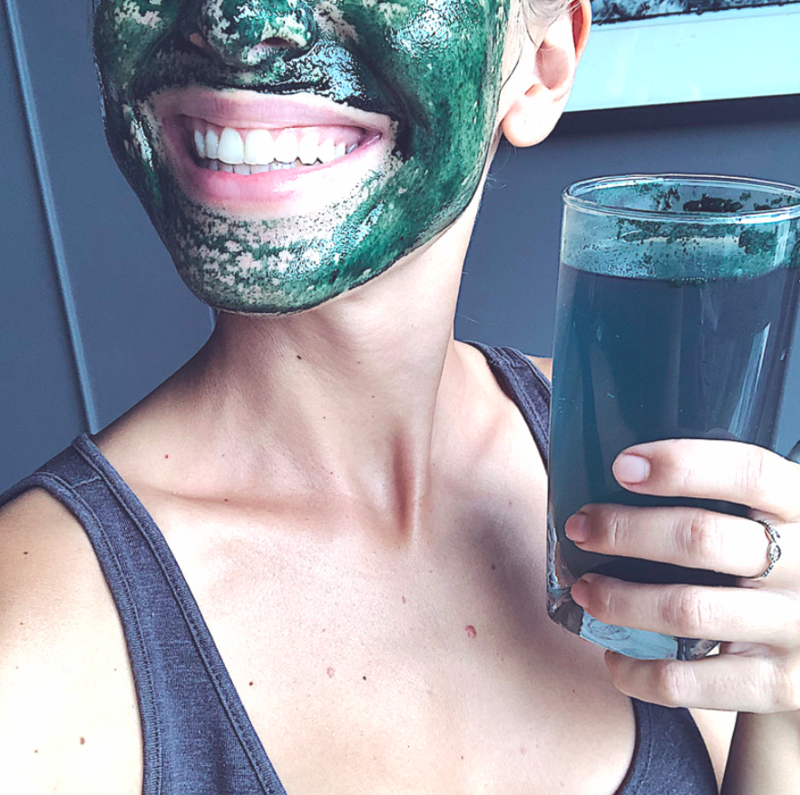 If you are a vata, you might know that feeling of very sensitive and irritated skin after having cleansed your face with a very ‘harsh’ cleanser – I do. For many years, when I was younger, I believed all those magazines telling me to buy this and that product to get rid of pimples etc., and all of the products were very harsh, so my skin for sure didn’t like that. After cleansing your face, you should moisturise it immediately after, to keep your skin hydrated. Look for warming and very moisturising products to use on your skin fx sesame, olive oil, shea butter and honey. Vatas need more warm, cooked vegetables. They do not do as well with raw vegetables, since this can help contribute to dryness and slow down digestion. Vatas usually already have slow digestion, so eating raw vegetables does not work that well for them. Try lightly cooking or steaming your veggies instead. Eating warm veggies is very grounding for vatas, which is exactly what they need. Warm veggies will also help warm them up from the inside and out. Hi everyone! It’s been forever. Big jokes on me when I last posted and said that I was going to start posting regularly in here again. Well, that did not happen, because then uni started again and I got a bit overwhelmed. 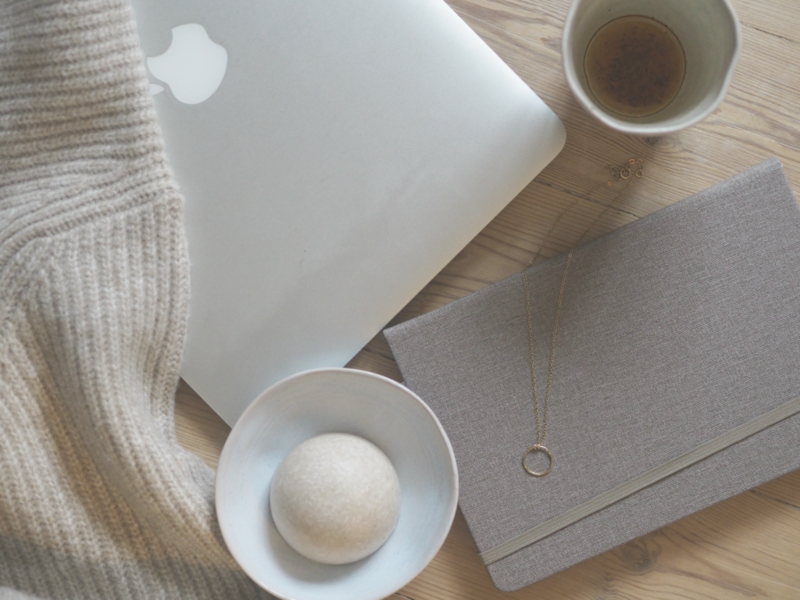 But now I’ve gotten into a a better routine and I have LOTS of ideas scribbled down and blog posts planned that I want to share with you here on the blog. First, I want to share 3 current favourites with you guys, which I’ve been absolutely loving lately! 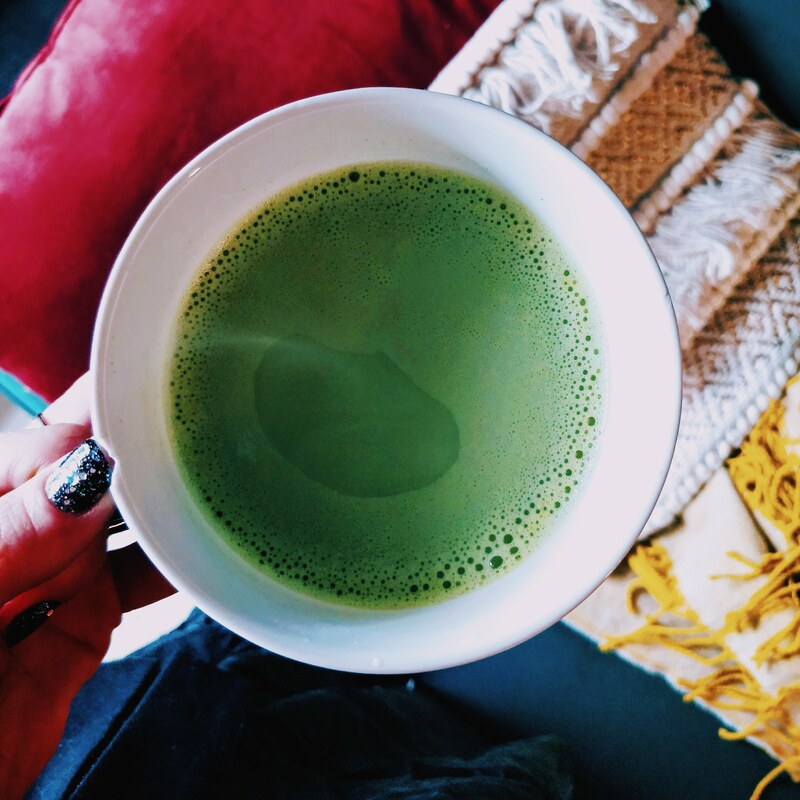 I absolutely love a (good) cup of matcha latte. Believe me, you can for sure also get some not-so-good ones out there (I’ve definitely tried that as well). 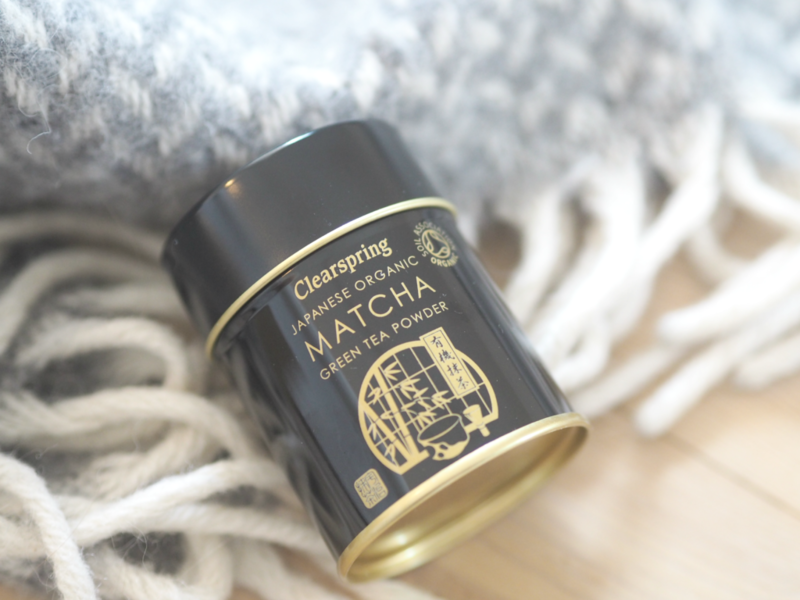 But, a good cup of matcha latte is just a delicious, comforting drink to sip on. I love to have it on cafés or to make it at home during the colder months and then drink it while reading homeworks or doing some work. It just makes the day a little bit better (and I’m all about adding those small things into your everyday life that brings you more joy!). I had a little period of time where I forgot about doing gua sha facial massage, but I just got back into it again, and wow, I just really, really love it! And, I feel like I do such a great thing for my skin. It really stimulates the blood flow and circulation in your skin. I can recommend the Honesty Beauty Talk’s book where you can read and learn a lot more about the benefits of gua sha massages. 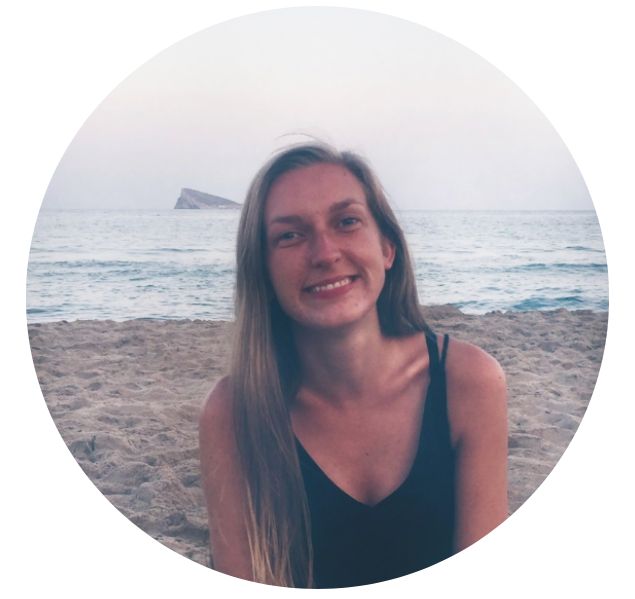 As some of you might know, I have got a new job, in a health store – and I absolutely love being surrounded by healthy food products, supplements and natural skincare! A few weeks ago one of my colleagues recommended me to try the Antipodes Grapeseed Butter Cleanse, and I have fallen completely in love with it. This is the perfect cleanser, especially if you have dry skin, since it leaves your skin so smooth and soft afterwards! I feel like having a real spa night every night when I apply this to my face. 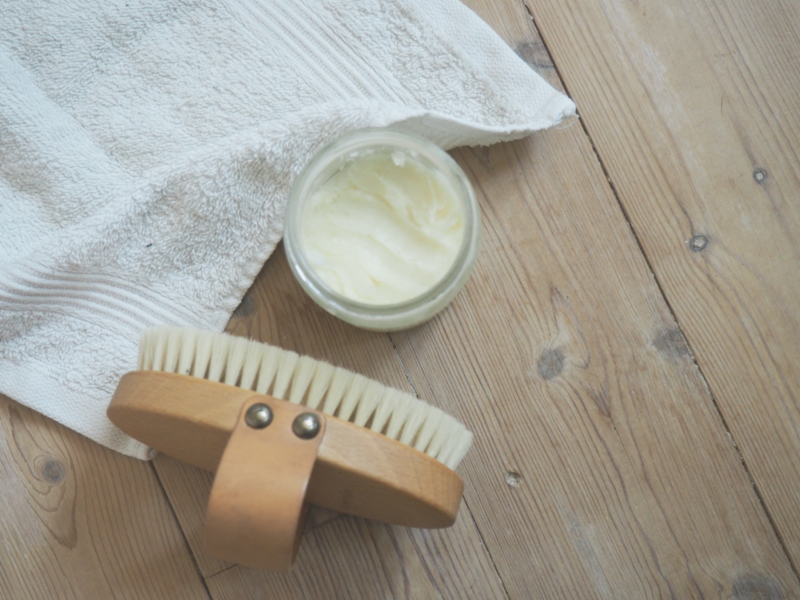 It just smells divine and I love the little ritual with applying it in circular emotions, and then use a damped wash cloth over my face to gently remove it – it’s just the best! What are your current favourites? Whether that be a new tea you have just tried, a book you have read recently, or something else! Share it in the comments and let’s us all inspire each other! Indlæg skrevet i samarbejde med Naturligolie.dk, som har sendt mig nogle af deres produkter. Jeg har selv brugt deres olier igennem de sidste 2-3 års tid, og jeg er så begejstret for dem. Indenfor de sidste par år er jeg virkelig begyndt at tænke mere og mere over hvad jeg bruger af produkter i alle livets aspekter. Jeg vil gerne have, at de er naturlige og ikke er fyldte med alverdens kemikalier og tilsætningsstoffer. Dette gælder især når det kommer til hudpleje, da jeg har lært at 60 % af hvad vi putter på vores hud bliver absorberet ind i blodbanerne og påvirker vores hormonsystem og krop, og dermed vores overordnede sundhed. Det er netop på grund af ovenstående at jeg er blevet så vild med Naturligolie og deres produkter. Her får man de reneste, økologiske olier og det tilmed i en glasflaske i stedet for plastik. For ikke at nævne, at al deres emballage som produkterne bliver sendt afsted i er genbrugeligt og helt uden plastik, det er jeg virkelig stor fan af! Her er man altså sikret at man ikke putter nogle dårlige ingredienser på sin hud, men kun sunde, nærende, økologiske og rene olier som virkelig går ind og nærer og plejer huden. At vælge økologiske produkter er ikke kun godt for din hud og din egen sundhed, men er også med til at passe på planeten, da produktionen af råvarerne dermed ikke er blevet sprøjtet med pesticider som går ned og forurener og skader jorden. Jeg kan rigtig godt lide at man hos Naturligolie kan købe enkelte olier, og så kan man helt selv gå ind og blande og mixe som man vil. På den måde kan man lave en olie mix som passer præcis til ens egen hudtype. Jeg har selv siddet og studeret alle de forskellige olier og læst om hvad de er gode til, samt taget testen på deres hjemmeside for at finde ud af hvilke olier der er gode til lige netop min hudtype. Det er nemlig virkelig individuelt hvad for olier du har behov for, afhængig af din hudtype – om den er tør, moden eller om du har tendens til uren hud osv. Jeg har tendens til tør hud / uren hud, og er for tiden rigtig glad for at bruge hybenkerneolie blandet med lidt granatæble olie og jojoba olie. Jeg synes at olier er så skønne at smøre på huden, de sørger virkelig for at huden bliver dejlig blød og fugtet og når man så tilmed går ind og læser om de forskellige egenskaber som de diverse olier har, så bliver det bare endnu bedre, for så føler man virkelig at man gør noget godt for ens hud. Jeg har nu brugt olier i både ansigtet og på kroppen de sidste mange år, og jeg er virkelig glad for det – det gør huden smuk, blød, smidig og fugtet. Du kan også lave dine egne produkter ud af de forskellige råvarer du kan købe hos Naturligolie. Jeg har selv lavet min egen læbepomade, en ansigtscreme og body butter – dem kan du finde opskrifterne på lige her. Har du prøvet at bruge olier i ansigtet? Eller på kroppen? Hvis ja, hvilke olier er dine yndlings? 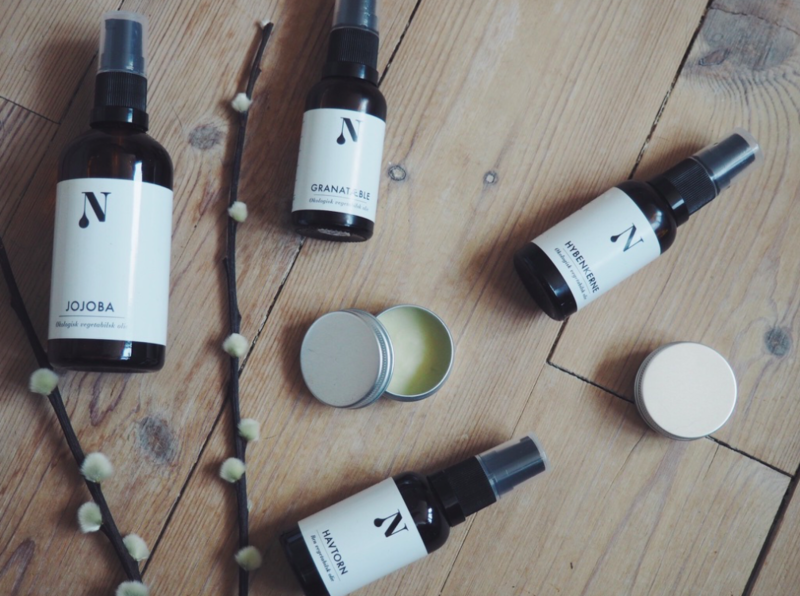 This post is written in collaboration with Naturligolie.dk (Danish company which means ‘Natural Oils’), which have send me some of their products. I’ve personally used their products during the last 2-3 years and I’m so happy about them. Within the last couple of years I’ve really started to think more about what I use of products in all aspects of life. I want them to be natural and not filled with harmful chemicals and additives. This is especially important to me when it comes to skincare products, since I’ve learned that 60 % of what we put on our skin is getting absorbed into our bloodstream and affects our hormonal system and our body, and thereby our overall health. It is exactly because of the above information that I’m so into Naturligolie and their products. Here you get the purest, organic oils and you also get them in a glass bottle instead of a plastic bottle. Not to miss, all their packaging which the products get send in is recyclable and completely without any plastic, and I really like that! Here you are ensured that you won’t be putting any bad ingredients on your skin, but only healthy, nourishing, organic and pure oils which really nourishes the skin. To choose organic products is not just good for your skin and your overall health, it also helps protect the health of the planet since the production of the raw materials is not getting sprayed with pesticides which then absorbs into the ground and damages the Earth. I really like that you from Naturligolie can buy oils separately and thereby go in and mix it together just as you like. In that way you can make a mixture which fits exactly your skintype. I’ve been reading about all the different oils and what they are good for, and taken the test on their website to find out which oils are especially good for my skintype. Because it’s really individual what kind of oils different kind of skin types need – whether it is dry, mature or you have a tendency to breakouts. Personally I have a tendency to dry skin / smaller breakouts and I’ve become really fond of rosehipseed oil mixed with some pomegranate oil and jojoba oil. I really find oils to be so lovely to put on the skin, they really make sure that the skin gets soft and moisturised, and when you start reading about the different benefits of the different oils it just gets even better, because then you really feel that they make a difference on your skin. I’ve now been using oils on my face and body for the last couple of years and I truly love it – it makes the skin glowy, soft and moisturised. You can also make your own products from the products which you can buy through Naturligolie. 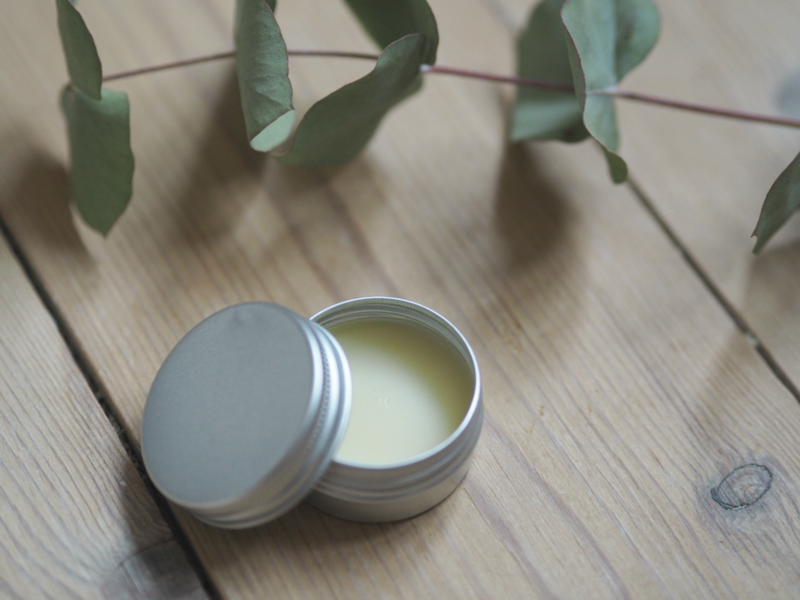 I’ve personally made a lip balm, a face cream and a body butter – you can find the recipe for those right here. Have you tried using oils on your face? Or on your body? If yes, then what are your favourite oils? It’s time for another book recommendation, and this one I read in like 1-2 days, it is exactly what I LOVE to read about: health and beauty and natural ingredients which doesn’t harm you or the planet. 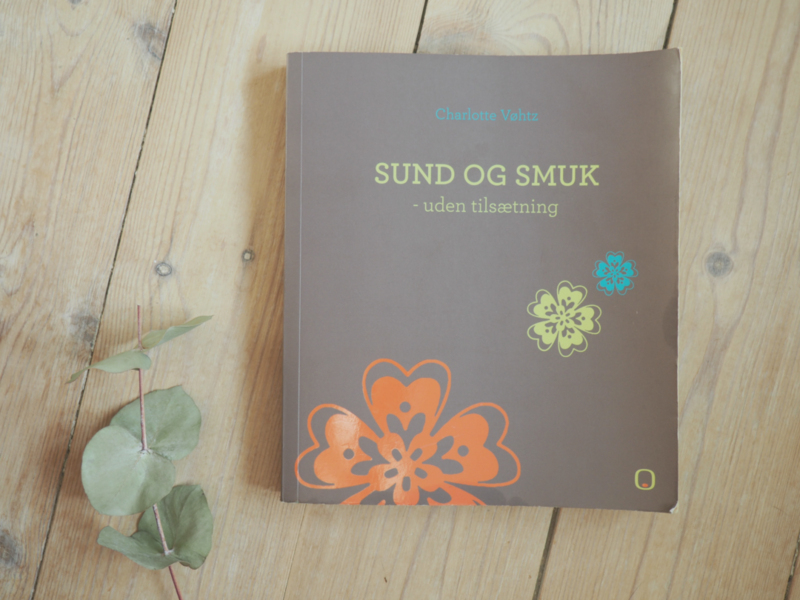 The book is called Naturally Gorgeous and is written by Charlotte Vøhtz which is also the creator behind the brand Green People. I really find Charlotte’s story inspirering, she started her brand Green People because her daughter got eczema and they couldn’t find any products which she could use, so Charlotte created her own brand. I got this as a birthday present from my sweet friend Ida, and she really knows me, because if I should have written a book, then this is basically what I would have written. 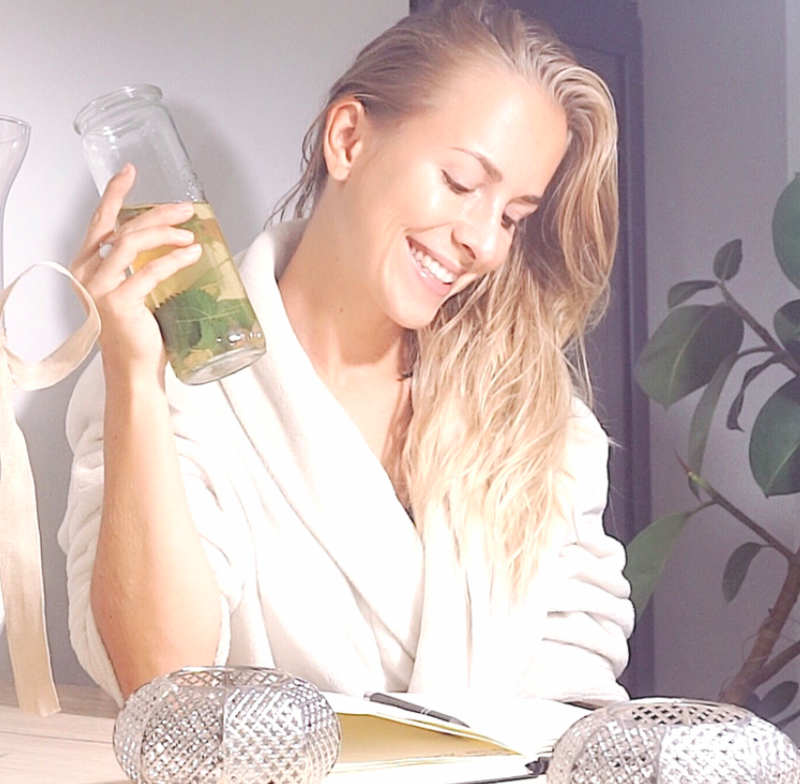 It’s all about avoiding toxic ingredients in your skincare and food, eating nourishing food, drinking water and herbal teas, lots of suggestions for natural skincare, recommendation for dry brushing, DIY recipes for skincare products etc. You get the drill. 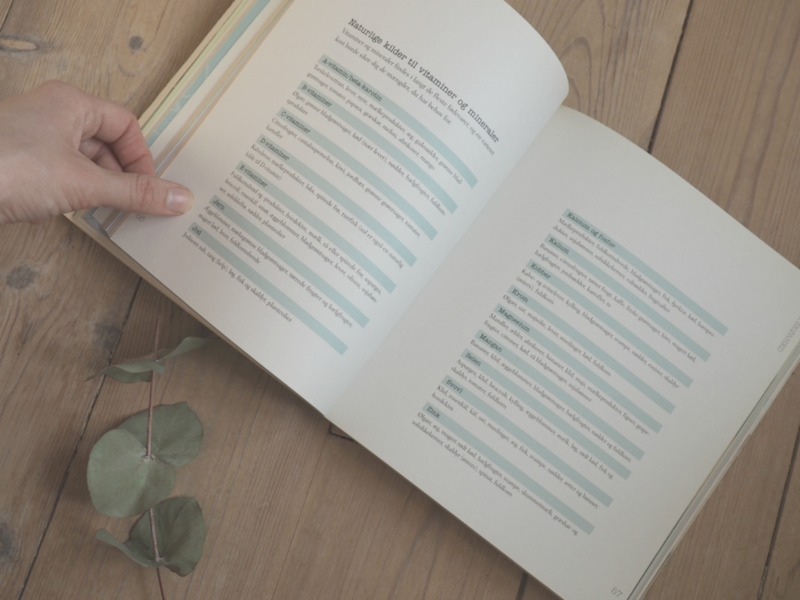 If you love natural skincare and beauty as much as I do, and I almost bet you do if you follow me either here on my blog or on Instagram, then you would for sure love this book as well. 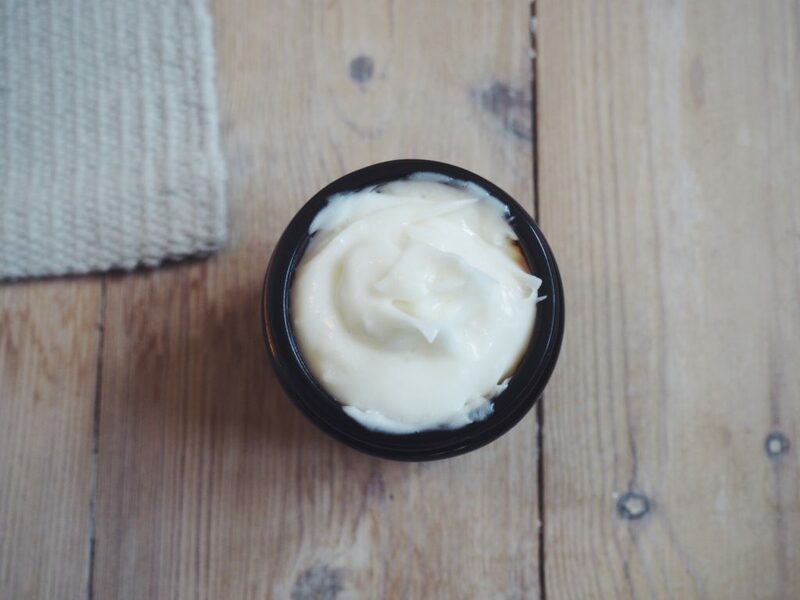 I’ve also tried to make my very own face cream, and it turned out really well, it’s so thick and moisturising, perfect for dry winter skin! 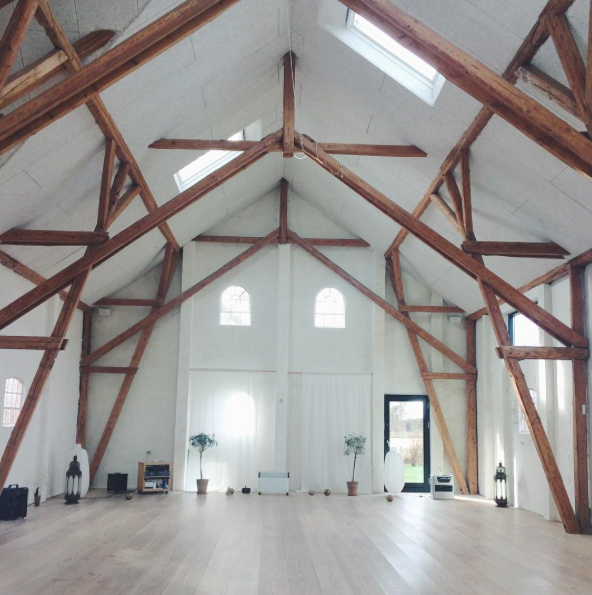 I spend the weekend in this beautiful place (Mellem-Rummet) at Samsø on a yoga retreat held by Cathrine, and a lot of kind and loving people. We ate lots of delicious, healthy vegan food, practiced yoga, relaxed, drank herbal teas and just had time to just be. So lovely! I just tried making my own face cream the other day, and it turned out really well. I asked you guys on Instagram if you wanted the recipe, and that was a solid yes! So, here you go! The recipe is made with only 4 natural and pure ingredients and water. Simply, easy and you are then assured that you only put good ingredients on your face. Because remember, whatever you put on your skin gets absorbed into your body. Therefore I want to use as pure ingredients as possible. 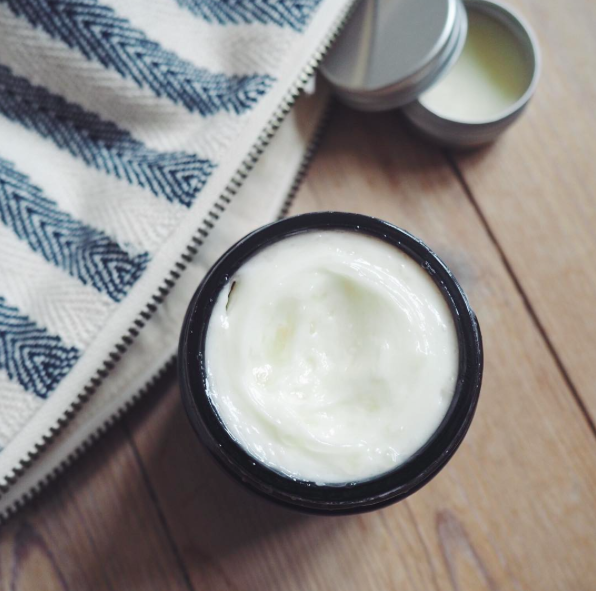 The face cream is very moisturising, and perfect for dry winter skin. This cream is also perfect if you have very sensitive skin, because all the ingredients are very gentle and soothing. 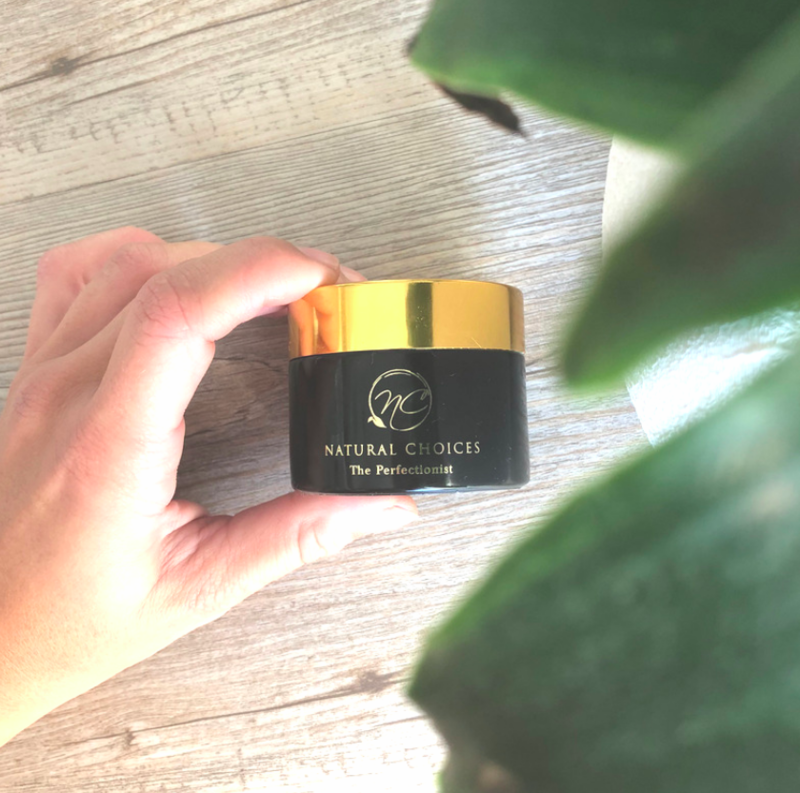 If you are not used to putting oils on your face, then you might find the cream a bit too greasy to use as a day cream, but it sure is perfect for a very moisturising night cream. It is so simple, you just put all the ingredients into a double boiler and melt it all together. Once it is all melted, you put it into the freezer for 15-20 minutes. Then you take it out and use a mixer to blend it all together until it has a nice, smooth consistency. 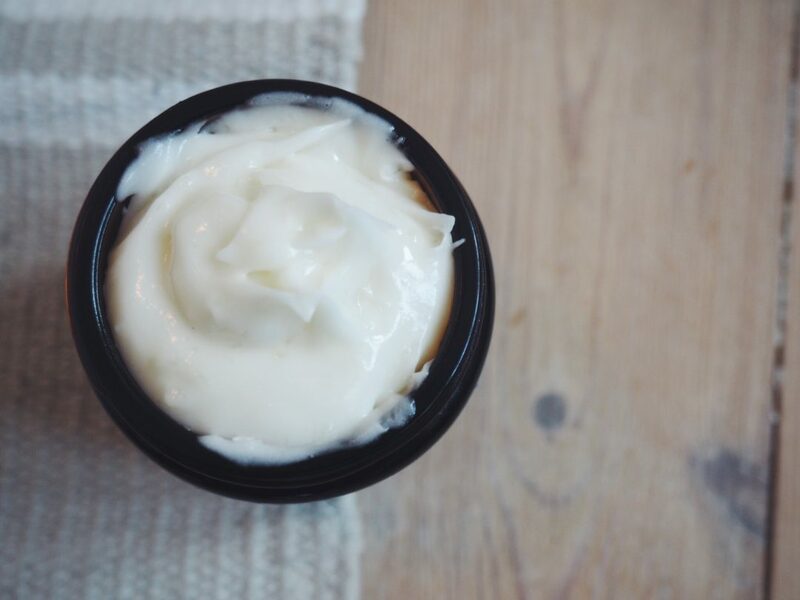 Then use a spoon to scoop it into a glass or tin container, and voila you’ve got yourself your very own face cream! 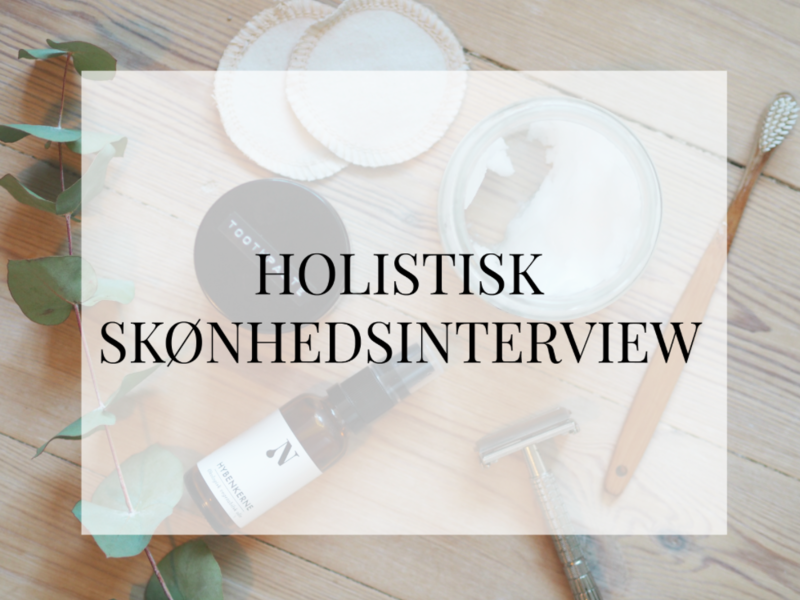 Hvis du ikke allerede har læst de mange forskellige holistiske skønhedsinterviews her på bloggen, så kan jeg kun sige at der er masser af gode tips og anbefalinger at finde fra nogle af de skønneste damer! Jeg skrev til 4 kvinder som jeg finder særligt inspirerende indenfor det mere holistiske skønhedsunivers og de har delt ud om alt fra deres yndlingsprodukter, deres bedste selvforkælelsestips, til deres morgen og aften rutiner. Jeg elsker at læse om andres skønhedsrutiner og små ritualer, og jeg valgte derfor at skrive til nogle kvinder som jeg finder særligt inspirerende indenfor dette område. Den fjerde i rækken af holistiske skønhedsinterviews er Nelle. Nelle er uddannet kosmetolog, og har arbejdet med adskillelige make-up og beauty brands. Derudover har hun arbejdet med spillefilm, musikvideoer, reklamefilm, lookbooks og fotoserier til magasiner. 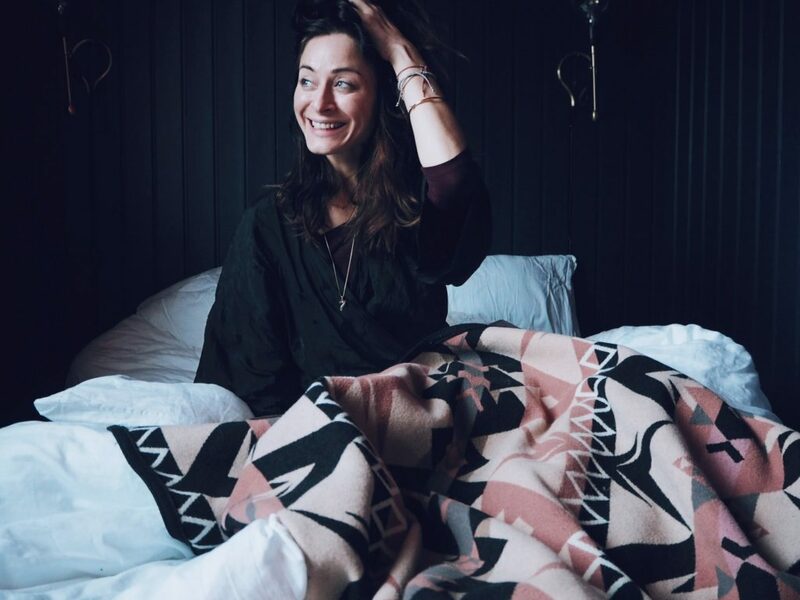 I dag har Nelle en stor passion for det holistiske, hvor hun på sin blog, youtube og Instagram deler ud omkring alt fra hudpleje, make-up, sundhed, selvværd og meget andet! Hvis du vil vide mere omkring Nelles skønhedsrutiner, så læs med nedenfor. Hvad er, ifølge dig, det bedste man kan gøre for dig selv og sin hud/krop (både fysisk og mentalt)? Meditation er det korte svar. Jeg tror på, at ro i krop og sind er det bedste man kan give sig selv og dermed også huden. Når vi formår at slappe af nedsættes kroppens stress hormoner og cellerne kan nyde godt af alt det gode vi spiser i stedet for at stresse, hvilket jeg har erfaret giver en enormt flot hud. Win, Win! Hvad er dine yndlings produkter til ansigtet? Hvad er dine yndlingsprodukter til huden? En god hamp handske og body olie. Det kan være mange forskellige. Plus gode, rene kosttilskud. Er ret glad for brandet vitaviva! Har du en særlig ’selvforkælelses rutine’ når du rigtig skal forkæle dig selv og din hud, krop og sjæl, og hvad består den af? En god bog, serie eller plade, en ansigtsmaske, ny neglelak, lækre æteriske olier og en god kop te, raw kakao eller et glas vin. Så bliver det ikke meget bedre. Hvordan er din aften rutine? Hvordan er din morgen rutine? Jeg vågner kl. 8 gerne efter 8-9 (10) timers søvn – elsker at sove! Så tjekker jeg Instagram og siger godmorgen til min kat (Emma), derefter mediterer vi (hun ligger på min mave) i 20 minutter. Hvis jeg har god tid laver jeg et par yogaøvelser, ellers sætter jeg straks min playliste på, med en masse sange der gør mig glad, så jeg er sikker på at min dag starter med god energi. Derfra drikker jeg en grøn spinat smoothie og en stor matcha latte og så i gang med min hudplejerutine, som minder meget om den jeg laver om aftenen, bare omvendt. Så er dagen i gang! Tusinde tak til Nelle for at besvare spørgsmålene og for at lade os få et kig ind i hendes skønhedsrutiner! Læs også: Holistisk interview med Tanja Gregersen, Carolina Ellie og Tine Emilie Svendsen. 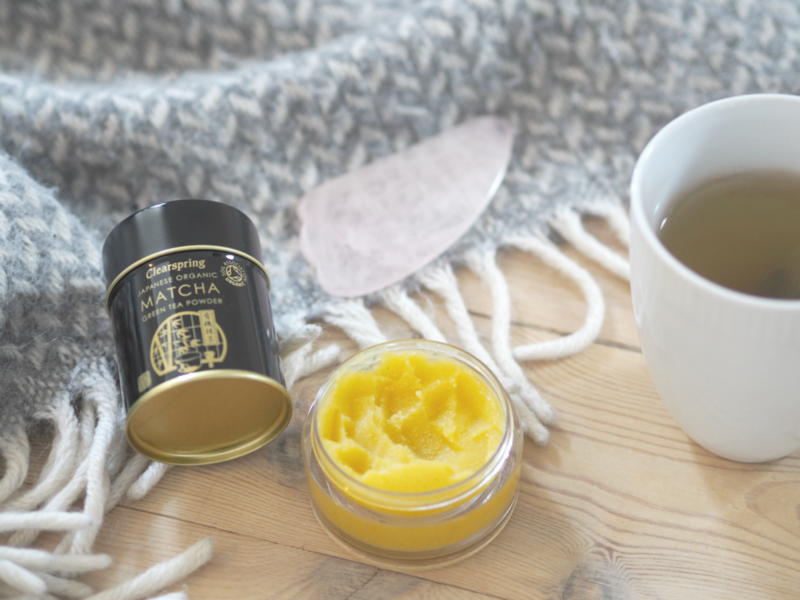 Today it’s going to be all about how you can make your very own natural and moisturising lip balm! It only consist of 4 ingredients and it is super easy to make. If you haven’t noticed it yet, then I can tell you that I love to make homemade skincare products. 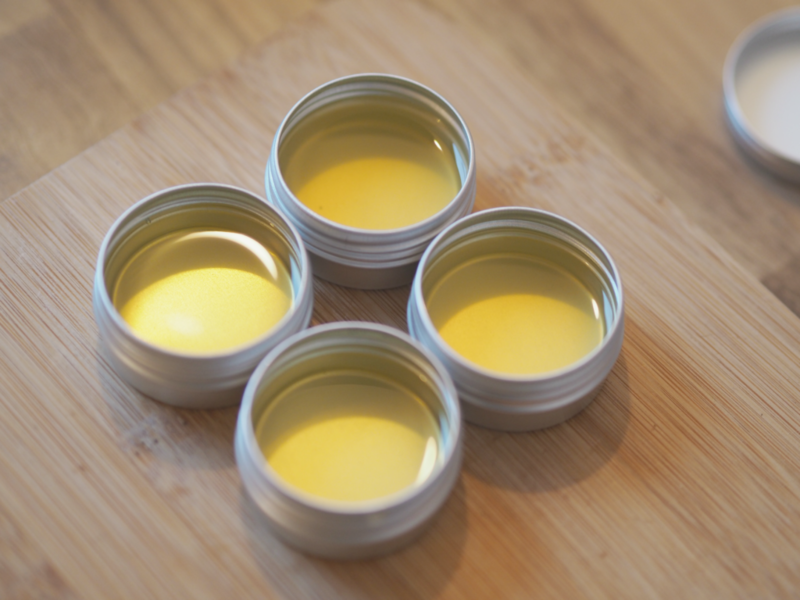 This time it was time to make homemade lip balm. I can absolutely not take credit for the recipe as I’ve mainly just followed ones I’ve found on the internet, but I’ve left out any kind of essential oils and just added some vitamin E oil. 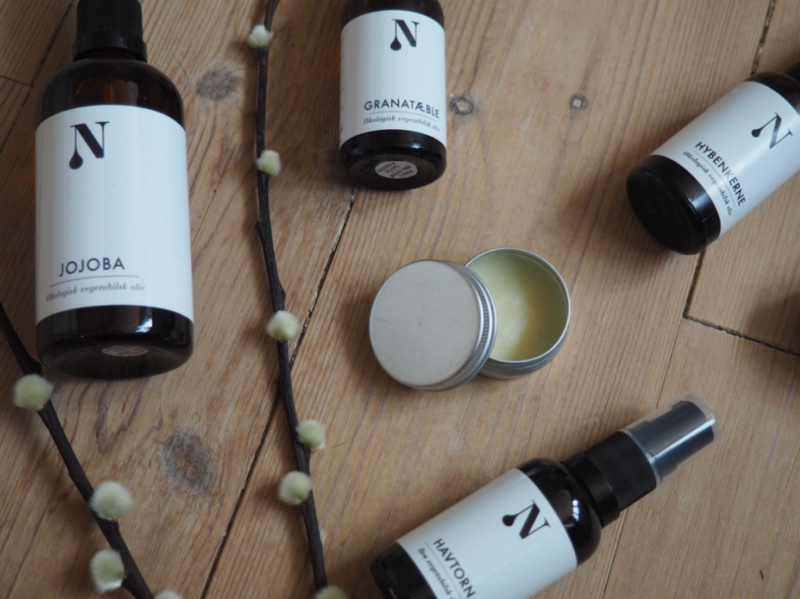 That is just my preference to leave out essential oils since I often find that lip balms can get too perfumed, and I actually just prefer the smell of more discrete and natural ingredients such as coconut oil and shea butter, this just smells divine, if you ask me! This amount fills 4 of these small tin containers. You put all the ingredients into a doubled boiler and wait for it all to melt and mix. Pour it all into small tin containers, I bought mine from Naturligolie.dk, and then put them in the fridge for about 1/2 hour. 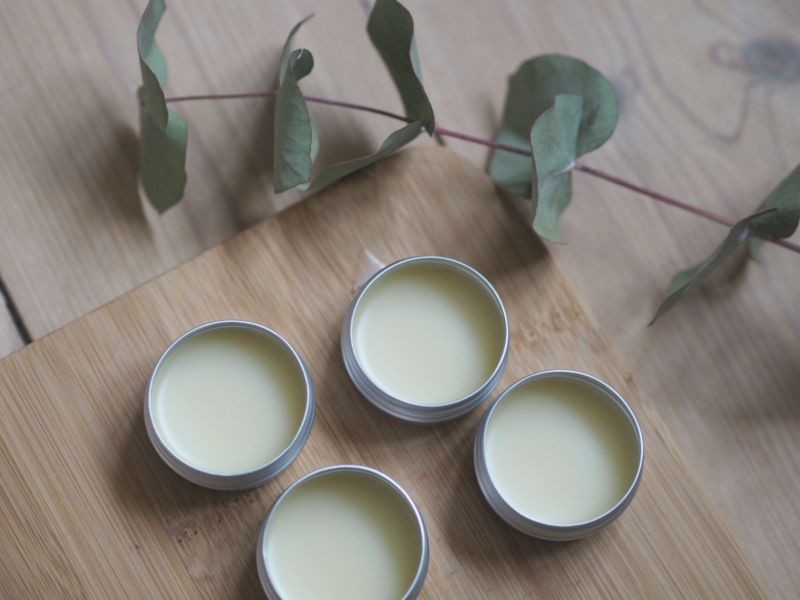 Easy peasy, now you’ve made homemade natural and moisturising lip balm! 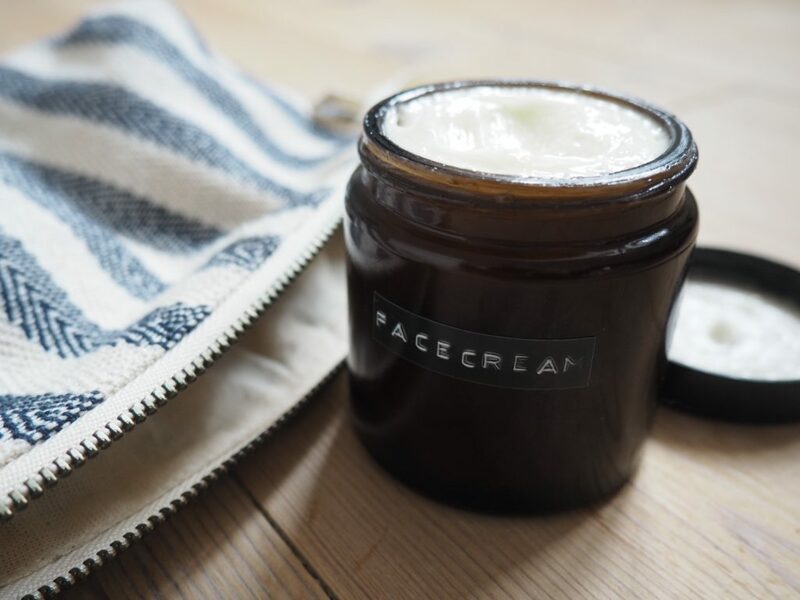 “This is also a lovely little gift idea, which you can either give alone or you can make a little gift basket filled with homemade body butter, a body scrub and lip balm!